Addressable advertising is the holy grail for TV broadcasters globally as they look for new means of growing revenues. Addressable advertising brings rich targeting and personalization which advertisers desire. To make addressable advertising work you have to serve single ads to the right household at the right time inserted over an IP stream. Ad insertion is difficult. On the web, latency of a few seconds is tolerable, but with a live TV broadcast, inserting an IP stream requires precision down to 1/25th of a second. Fortunately, the latest standards for two key broadcast technologies solve this problem. In Europe, and certain countries in Asia and Africa, you’ll find HbbTV 2.0.1 (Hybrid Broadcast Broadband TV). In the U.S., you’ll find ATSC 3.0 (the Advanced Television Systems Committee). While both HbbTV and ATSC are have a similar intent, they handle ad insertion completely differently. 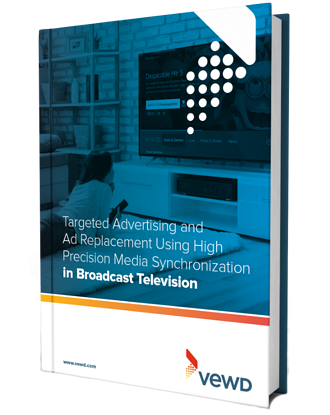 Download our white paper which compares the ad insertion approaches used by HbbTV and ATSC.